Through the thick of the day-to-day grind, one tends to just go through the motions, not ever really stopping to appreciate what's around them. Specifically, the unique personalities inherent in each family member. At least, I am oftentimes guilty of this "head down, forge on" mentality. We are out of town right now. A little respite from the grind. A few vacation days for Hubby and I while the boyz are on February break. Irony: It is snowing here in upstate NY at Gramma and Poppa's, while back home in Massachusetts, we hear it's raining. WE CANNOT GET AWAY FROM THE FRICKING SNOW. Yesterday we took the boyz ice skating. Knowing my children so well, my momma notion was that Eldest, who excels at pretty much everything, would take to the ice right away and automatically be good at it. 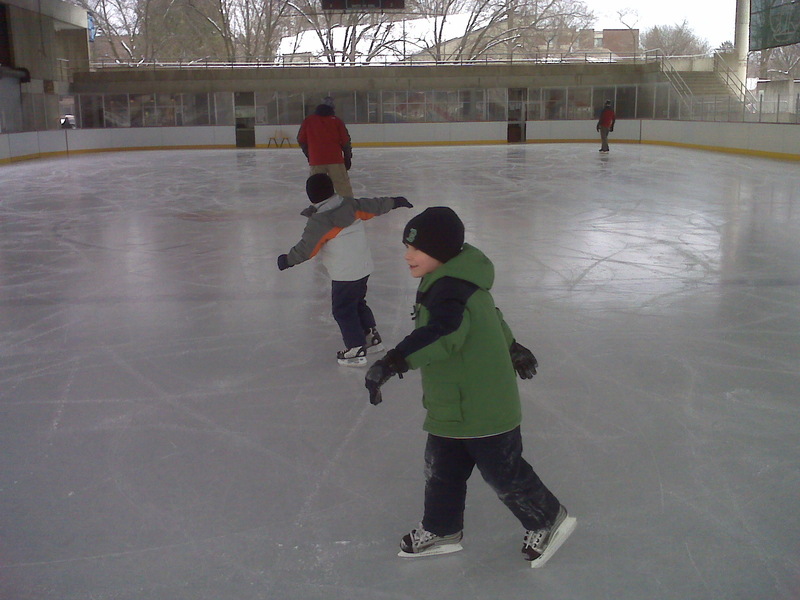 That Middle, who is often whiny, would hate being cold and wouldn't like being out on the ice. And that Baby, who is a little spitfire, would just zoom around, not even caring if he fell. And once again, just like that, I was reminded that these children of mine are each unique. That even though they're brothers, and share many similarities, that they each are special individual wildflowers. Heh. 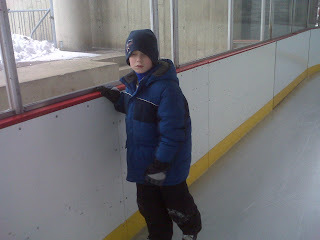 No matter how much he wanted to get out there and skate like Milan Lucic, Eldest could NOT get the hang of it. His ankles caved in. His legs wobbled. He fell. And fell. And fell. And predictably enough, there was an "injury". You would have thought his knee was broken and required immediate amputation. There was drama. There were tears. And plenty of pouting. 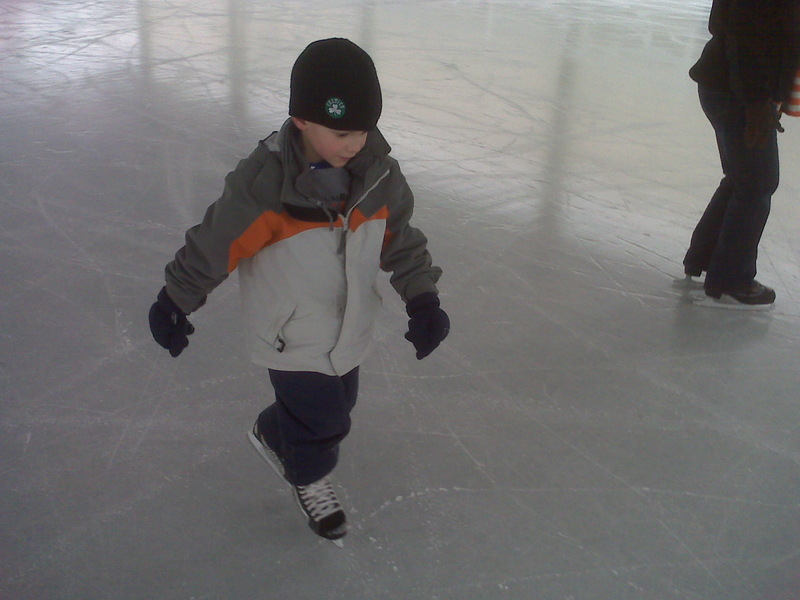 Baby, as we figured, was indeed a little spitfire on the ice. But he quickly lost interest. He was hungry. He was thirsty. He was all.done. Middle was the surprise. He LOVED it. 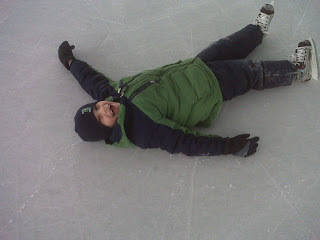 And was a great skater right away! (Which ticked Eldest off even more.) He zoomed. He laughed. He spun. He fell (sometimes HARD) and bounced right back up. My child, who we joke is agoraphobic because he loooooves weekends when he can stay in his jammies all day and night and never leave the house? Had.A.Blast. And was a true joy to watch. While his two brothers were being total pains in the asses. All this is just to say that sometimes it's nice to have these sorts of reminders. To not stereotype my children. To remember that they will always possess the capacity to surprise me. On a daily basis. And that I should never take them, or their abilities, for granted. And I love them even more for it. What a lovely post. That is what makes children so fun.. the surprises. Let's hope they are all good ones. They never do what you think they are going to do. Switch skating with skiing and same thing happened here! Only our eldest is the whiner, and middle is the one who things come to naturally. I snicker to myself when I hear eldest trash-talk middle about his skiing ability. Finally there is something he does better!! The only thing predictable is their unpredictability!! Yes, it's raining. HARD. Also? My inlaws are in upstate ny. Also? Took my kid skating today. Also? call my kids boysz! This post made me smile. My daughter is only 13 months, but I already see her little personality emerging more and more each day. This makes me so excited for when she gets older. Stopped by from SITS! That is one of the many things that I love about being a mom....they never cease to amaze!